19th century etching of Henry II whipped by monks for the murder of Thomas Becket. 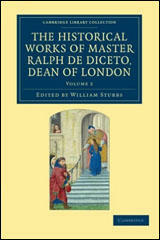 Ralph de Diceto died in about 1202. King Henry sought to help those of his subjects who could least help themselves. When the king found that the sheriffs were using the public power in their own interests... he entrusted rights of justice to other loyal men of his realm. When he (Henry II) reached Canterbury he leaped off his horse and, putting aside his royal dignity, he assumed the appearance of a pilgrim, a penitent, a supplicant, and on Friday 12 July, went to the cathedral. There, with streaming tears, groans and sighs, he made his way to the glorious martyr's tomb. Prostrating himself with his arms outstretched, he remained there a long time in prayer. 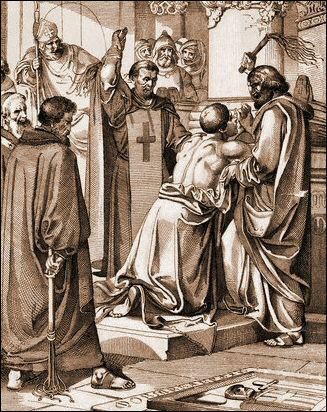 He asked for absolution from the bishops then present, and subjected his flesh to harsh discipline from cuts with rods, receiving three or even five strokes from each of the monks in turn, of whom a large number had gathered... He spent the rest of the day and also the whole of the following night in bitterness of soul, given over to prayer and sleeplessness, and continuing his fast for three days... There is no doubt that he had by now placated the martyr. 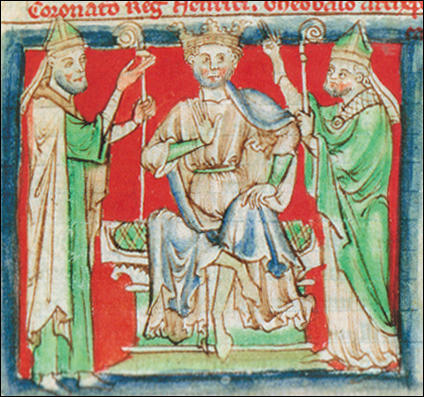 The king (Richard I) had forbidden by public notice that any Jew or Jewess could come to his coronation... however, some leaders of the Jews arrived... the courtiers laid hands on the Jews and stripped them and flogged them and having inflicted blows, threw them out of the king's court. Some they killed, others they let go half dead... The people of London, following the courtier's example, began killing, robbing and burning the Jews.